I live for a party. Always. 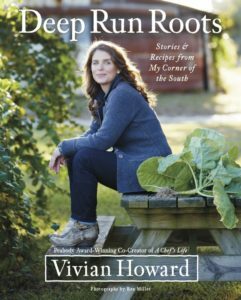 So, when I got my copy of celebrity chef Vivian Howard’s Deep Run Roots cookbook, I knew I had to plan a dinner get-together. I’m admittedly a fangirl of Vivian’s. Through her PBS show, A Chef’s Life, she brings respect and attention to Southern cuisine and culinary traditions. She features North Carolina chefs, farmers, and neighbors that share their family recipes and stories, and her food brings family and friends together. Deep Run Roots is a visual treat with as many history lessons as there are recipes. Each section spotlights a North Carolina ingredient – watermelon, sausage, beets – and describes its place in Southern culture. The photos of messy tomato sandwiches and tempura-fried okra look like dressed up versions of the foods I ate growing up in central North Carolina. What do Y’all Want to Eat? For the sake of full disclosure, I’ll note that I make an effort to eat healthy. But this party was going to be about enjoying the flavors that spring from North Carolina soil. This meal would be a testament to tastes – not necessarily diet-friendly. Slightly overwhelmed by the thought of a three-course dinner party, I asked my mom to join me in the kitchen. She’s a lifetime North Carolinian, expert buttermilk biscuit maker, and she can throw a themed party like no one else. 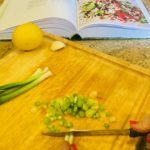 We wanted dishes from Vivian’s book that featured seasonal ingredients, showcased a variety of flavors and matched my cooking skills (beginner, but I’m working on it). 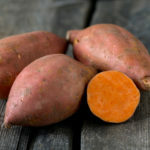 Hosting this party in early spring narrowed the seasonal ingredient choices, but sweet potatoes, grains, and local meats are easy to find year-round in North Carolina. Our final menu included: Sprouted Hoppin’ John Salad with Hot Bacon Vinaigrette, Grandma Hill’s Candied Yams and Blueberry BBQ Chicken – a recipe Vivian made famous at Chef & the Farmer, her restaurant in Kinston, N.C. Blueberries aren’t in season until mid-May, but the BBQ recipe looked too tasty to leave off our menu. One of the hardest parts about hosting a dinner party is timing all of the dishes to be ready around the same time. As we planned our day in the kitchen, we realized that the field pea sprouts needed for the salad required a few days of preparation. But a great chef knows when to improvise! So, we swapped the sprouts for a similar bean and crossed our fingers it would taste fine. The sweet potatoes roasted for at least an hour, then I removed the skins and sliced into medallions. 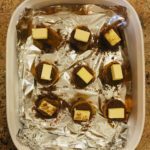 Once topped with a mix of brown sugar, cinnamon, nutmeg, butter and orange zest, they were ready for the oven. It was really that easy! While I handled the candied yams, mom prepped ingredients for the salad so we’d be able to throw it together as the other dishes were finishing. The salad’s base includes rice, field pea sprouts, arugula and red pepper. It’s dressed with a hot bacon vinaigrette. Mom fried bacon – picked up at our local butcher – and mixed part of the drippings with honey, lemon juice, sherry vinegar and more to make the dressing. The last dish to make was the chicken. We don’t cook much chicken on the bone, but for this party, we wanted to do things Vivian’s way. 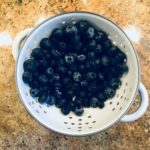 The whole chicken cooks on the grill and every 20 minutes or so is basted with the blueberry sauce. 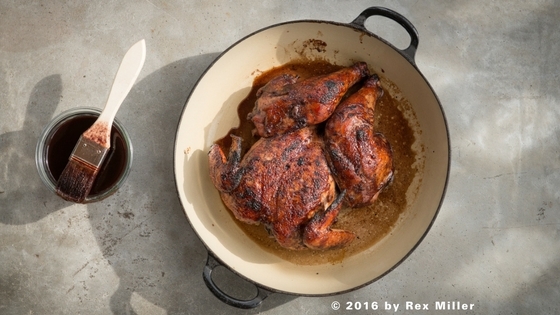 It starts to glaze and looks terrific – I get why it’s a favorite at Chef & the Farmer. Since my mom is a party pro, the dishes were all ready to be served at the same time. The chicken came off the grill and got one final douse of the BBQ sauce. The candied yams caramelized and smelled incredible. And the hot bacon vinaigrette was poured over the salad just enough to wilt the greens. Dinner was served! It’s no surprise these dishes were tasty. Vivian Howard is not one to be doubted. The Hoppin’ John salad was warm, hearty and savory – and our substitute bean worked! 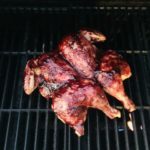 The chicken was moist, and the blueberry BBQ sauce added a flavorful, fruity punch. The candied yams were sweet, with the orange zest supplying a slight tang. Each dish had layers of flavor, and together they made for a beautifully plated meal. 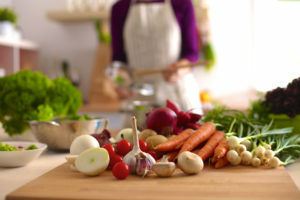 The different North Carolina ingredients, mainly fresh produce, made the meal colorful, flavorful and healthy. 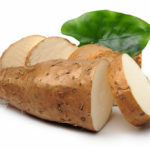 The recipes were easy enough for me to follow, and I enjoyed learning about the ingredients as we cooked. But, the best part of the meal and the main reason I love food is that it brings people together. Vivian knows this, and it’s visible in the love and care she puts into dishes she learned from her mother. Food has been central to her life – she grew up on a working farm – and each meal she prepares honors North Carolina’s customs and history. I felt the same connection cooking this meal with my mom. Many stories from her childhood involve food and family. She grew up on collards, fresh pork, and fried chicken. We have recipes passed down from her mother, and she has tried many times to teach my sister and me how to cook. Whether it’s a celebrity chef-inspired dinner party or a basic comfort meal, it’s more fun to make food with and for people we love. When friends and family gather over food, the laughter, stories, and memories are better than any gourmet dish. But maybe make the Blueberry BBQ Chicken just in case. Melissa Biediger is a Public Relations Communications Specialist at Blue Cross NC, working closely with the media and customers to tell our story. She loves exploring North Carolina through hiking and visiting restaurants and breweries. Her favorite spot in North Carolina is anywhere on the coast, book in hand, listening to the ocean.